Well, I put on my shoes and I started. Going up some roads and down some others to see what Negroes do for a living. Going down one road I smelt hot rosin and looked and saw a “gum patch.” That’s a turpentine still to the outsider, but gum path (sic) to those who work them. It was not long before I was up i (sic) the foreman’s face talking and asking to be talked-to. He was a sort of pencil-shaped brown-stained man in his forties and his name was John McFarlin. He got to telling and I got to listening until the first thing I knew I was spending the night at his house so I could “Ride the Wood” with him next morning and see for myself instead of asking him so many questions. So that left me free to ask about songs go (sic) the turpentine woods. Foreman McFarlin had me up before five o’ clock next morning. He had to wake up his camp and he always started out about 5:30 so that he had every man on the job by 6. Every man took his tools, went to his task-whatever he was doing when he knocked off at 5:30 the afternoon before, he got right on it in the morning. The foreman had 18 men under him and he saw everyone in his place. He had 5 chippers, 7 pullers and 5 dippers and a wood-chopper. 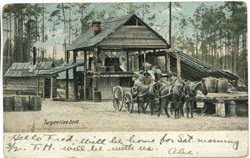 All the men off to work, John McFarlin straddled his horse, got one for me and we began riding the wood. Talking about knowing his business! The foreman can ride a “drift” and with a glance tell if every “face” on every tree has been chipped. First he rode a drift of virgin boxes. That is when a tree is first worked, it is a virgin box for three years. That is the finest rosin. The five men were chipping away. 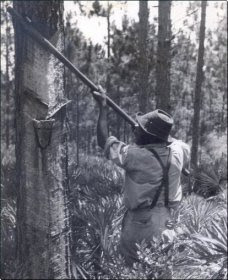 The chipper is the man who makes those little slanting cuts on pine trees so that the gum exudes, and drains down into the box. He has a very sharp cutting tool that heavily weighted in the handle and cunningly balanced so that he chips at a stroke. 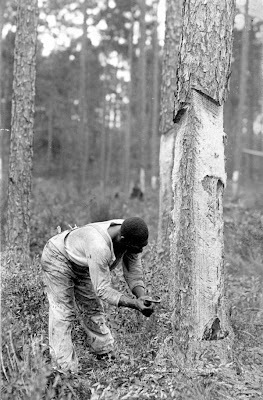 The company pays a cent a tree. We stopped and watched Lester Keller chip because he is hard to beat anywhere in the world. He often chips 700 or more trees a week. A puller is a specialized chipper. He chips the trees when they have been worked too high for the chipper. He does this with a chipping axe with a long handle knows (sic) as a puller. The foreman explained that the tree are chipped three years and pulled three years then it is abandoned. Leroy Heath is the champ puller. He inspected a drift that was being dipped. 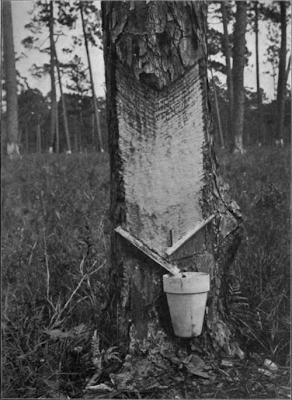 The men who dip take the cup off the tree, scrape out the gum with the dipping iron and put it back in place and pass on to the next face. The dippers are paid $.85 a barrel for gum and 10 barrels a week is good dipping. Dan Walker is the champ. He can dip two barrels a day. 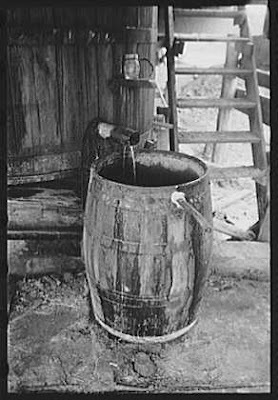 The wood-chopper cuts wood for the still. Wood is used to fire the furnace instead of coal because the company owns millions of cords of wood for burning in trees that have been worked out. McFarlin explained that thee(sic) is no chipping and dipping from November to March. In November they stop working the trees, scrape the faces, how(sic) and rake around the trees as a caution against fire. The foreman gets $12.50 a week, the foreman’s house, all the firewood he wants and all the gardening space he wants. He said shyly that he would raise(sic) in wages, but feels that he will not get it. He wants to know if the Government is sending people around to make folk pay better wages. He hopes so. 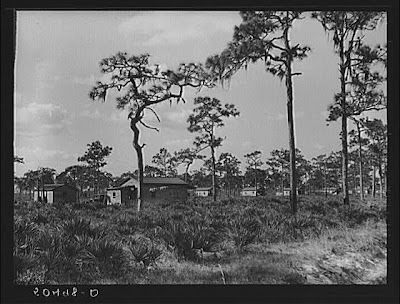 Zora Neale Hurston worked for the WPA, collecting folklife and folklore from Floridians throughout the state. She is pictured here collecting music from French and Brown. 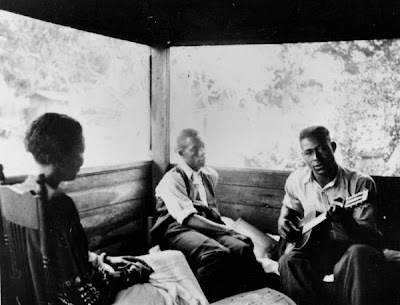 Photograph was part of a 1985 traveling exhibit called "Pursuits and Pastimes". 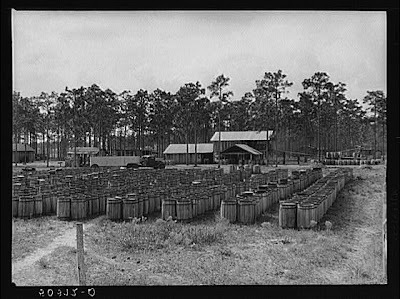 Reproducted from the collection of the Library of Congress. 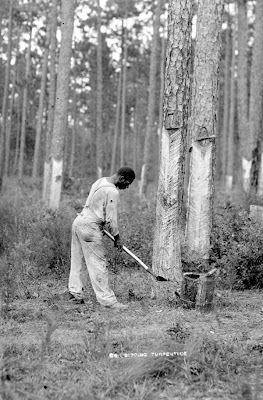 Forms part of series S1606, Florida Folklife Archive, Photographs and Slides of Folk Arts, Artisans, and Performers. Very informative. Thank you for taking the time to write this article. Great article. 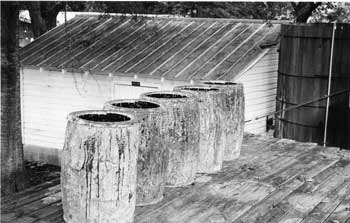 I grew up in Florida near Ocala and used to find remains of the orange clay catch jars laying about in the woods. I always wondered what they were from. 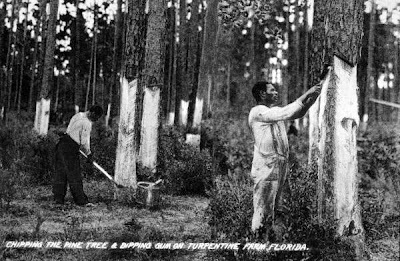 I found out later they were from the turpentine trade. At the great sacrifice and expense of the workers no doubt!